Majestic sunrise views. Custom built 3 story house. Main floor features open floor plan with hardwood floors, dining room, kitchen with cooking island, butler pantry with laundry room. Dining room features columns open to foyer. 2nd bedroom, used as study, adjoining bath between bedrooms. Great room with wrap around views and sliding doors to deck. Master on 3rd floor with his and her walk-in closets, whirlpool tub, separate shower & private deck. Downstairs is huge playroom, workout room or could be 4th bedroom or transform and make in-law or guest quarters. Garage and separate drive thru carport for 2 additional parking pads. Over 1 acre with fenced area and private dock. Fish and crab and enjoy all the benefits from living on the water. Sweeping Oaks and palm trees grace this property. Adjoining marsh front cottage and 2 separate lots are available. Vacation at Home and enjoy privacy and back island living at it's finest. Directions: Johnny Mercer to Penn Waller Rd, right on Walthour Rd, property on left Turn left across from Settlement subdivision--go down dirt driveway to the RIGHT of new construction house--go ALL THE WAY TO MARSH. 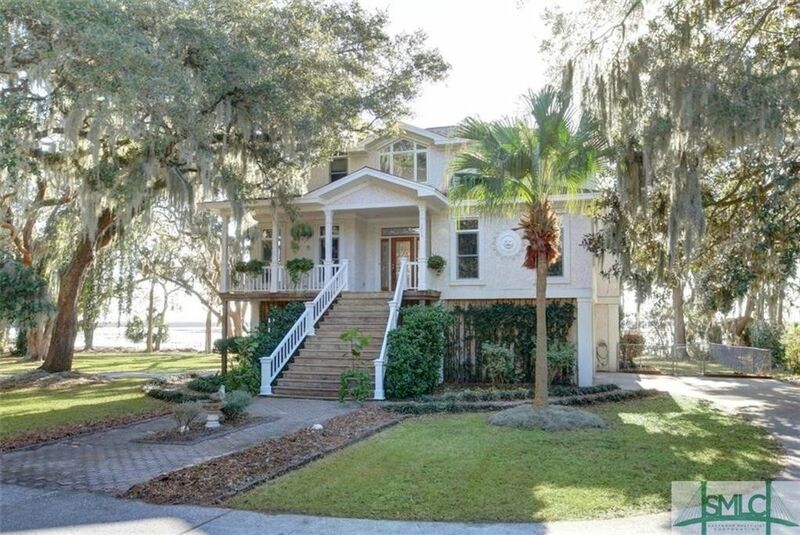 House has dock- Adjoining lot in front of house available for sale.